President Obama announced his new Pakistan-Afghanistan strategy today. Except for advocates of a strict counter-terror strategy in Afghanistan (as opposed to the administration’s plans for a counter-insurgency strategy that includes a healthy dose of nation-building), there is little to disagree with in the specifics. But in the big picture, while a new strategy may be needed for Afghanistan – the key front may be Pakistan. In the President’s statement Pakistan is primarily seen in terms of Afghanistan, that is how the growing Taliban presence in the Northwest Frontier Province provides support for the Afghani Taliban. If keeping up pressure on al-Qaeda is the top U.S. priority then this makes sense. But while there is no question that this should be towards the top of the foreign policy to-do list, it may not be number one. Keeping al-Qaeda on the run is a CT operation, heavy on intelligence and precision strikes. But the worst outcomes in Pakistan are truly the stuff of nightmares and preventing them will require a far greater commitment of resources (not just in financial and material terms, but also in terms of time and focus by decision-makers and key agencies). In Pakistan, the specter of radical Islam is very much a national threat. Radical groups including Lashkar-e-Taiba (LeT) have built an extensive infrastructure throughout the country, particularly Pakistan’s most powerful province the Punjab. According to some reports, substantial numbers of Punjabis are traveling to fight in Afghanistan. The Red Mosque siege highlighted that Islamist extremists have penetrated deep into the very heart of the country. Pakistan’s problems are not confined to a rebellious province. The entire country is in danger. A major crisis or collapse in Pakistan, even if the nukes remain secure, could have vast regional consequences. Major turmoil in Pakistan could create a massive refugee crisis (dwarfing that of Iraq). Millions of Pakistanis could destabilize neighboring India and the Persian Gulf Region. In a harbinger of possible things to come, there are hundreds of thousands of internal refugees in Pakistan fleeing from the violence of the tribal areas. Even a relatively stable Pakistan that, rather than imploding, slowly radicalizes, will have major effects. Pakistan itself will provide a near bottomless well of recruits to radical groups in Kashmir, Afghanistan, and across the greater Middle East – raising the temperature in a region that is already too hot. Through the international Pakistani diaspora this radicalism will be translated worldwide. In a sense, the President focused on the easy part of the equation. Achieving results with troops on the ground is extraordinarily difficult and requires great sacrifices by the troops. But American options and leverage in that situation are also high. Aid packages provide far less leverage, but in the case of Pakistan those are the best options available. A long time ago...National Review Online published a review I wrote of the debut of Battlestar Galactica. With the series finally ending (I'll write my thoughts on that later when I've had more time to process it) I thought posting the old review would be timely. December 15, 2003, 8:27 a.m. Growing up there was a science-fiction trinity — Star Trek, Star Wars, and the shortest side of the triangle: Battlestar Galactica. Star Trek was a well-established subculture when I began watching the reruns with my father. It was science fiction for the robust, confident liberalism of JFK: of "New Frontiers" and "bear any burden, pay any price." Star Wars, on the other hand, was the first really big thing in my life — a giant clash of good vs. evil. It was Ronald Reagan science fiction, and it was no accident that it became a cultural landmark when American confidence was at a nadir just before Reagan. Watching it as a boy I identified, of course, with Luke Skywalker. Now I realize I would have been in the Rebellion Communications Department — issuing press releases about the dangers of the Empire possessing WPD (Weapons of Planetary Destruction) and trying to place op-eds in Galactic Review Online arguing that Grand Moff Tarkin was not an Imperial moderate who could balance Vader's extremism. Since then Star Trek has made numerous returns — some good, some less so. Star Wars came back, but without the power of the original. The original was a space opera filled with larger-than-life (albeit thinly sketched) supermen constantly plucking victory from the jaws of defeat. In the new version the characters are human, fallible, and uncertain. Lorne Greene's silver-haired Commander Adama was regal — whereas Edward James Olmos shows his age. Imbuing the characters with depth and humanity requires that the series spend time developing them. But there is too much of a good thing — the premiere, including commercials, was over four-hours long. There is a dizzying array of rivalries, love interests, and emotional rifts — some interesting, some easily jettisoned. Political correctness also changes the new version. Some changes are obligatory and cosmetic; the old Battlestar Galactica's womanizing Starbuck is now a woman. Other changes are more interesting. In the original the Cylons were vicious robots that hated humanity — period. In the new version the Cylons were created by humanity, and their animus against humanity takes on religious overtones (some can also pass as humans). Humanity, on the other hand, feels guiltily responsible for the Cylons. It isn't Shakespeare, it isn't even Star Trek, but the central themes of Battlestar Galactica — of the fragility of civilization and of the consequences of its demise — still come through in the new version. It is a message worth hearing, again and again, now and in every time. — Aaron Mannes, who watches too much TV, is the author of Profiles in Terror: The Reference Guide to Middle East Terrorist Organizations and Affiliated Groups. Joshua E. London, Victory in Tripoli: How America’s War with the Barbary Pirates Established the U.S. Navy and Shaped a Nation (Hobocken, NJ: J.W. Wiley and Sons, Inc., 2005), 276pp., $24.95. Faced with a choice of appeasing hostage-taking Middle Eastern despots or overturning the international order, the United States hems and haws as its prestige wanes—until finally an outraged American public demands action. The European powers watch carefully, and maneuver to gain their own advantage. After marginal pinprick strikes, American forces mount a major campaign, receive rapid capitulation, and predictably fail to press their advantage. In Victory in Tripoli, Joshua London tells the story of the first American Middle East crisis. For centuries, pirates based in the North African states had been extorting European governments. Shortly after America’s independence, these bandits set their sights on the United States as well. The resulting hostage crises and plunder finally became so severe that the United States was compelled to construct a navy (indeed, the Barbary crisis effectively forced the debate towards those who felt the new nation should have a strong navy) and launch it against the Pasha of Tripoli. But the ensuing naval blockades and limited forays were mere pinpricks, and although the United States enjoyed some tactical successes, the Pasha became even more convinced that the United States lacked resolve. Victory in Tripoli is a page-turner that moves deftly between Washington machinations and naval maneuvers in the Mediterranean. London lets this terrific story tell itself, writing in a lean, effective style. A bit of explanation about diplomatic protocol at the turn of the 19th century, some decent maps, and perhaps a bit of background on naval warfare in the age of wooden ships (for those of us who don’t know a schooner from a sloop) all would have been useful—but these are merely quibbles. Most writers would have been temped to play up the parallels with today’s events. London, however, for the most part has wisely resisted this impulse, restricting himself to some wry descriptions. But the similarities between today’s troubles with the Middle East and the war with the Barbary pirates are unmistakable: disputes between the diplomats and the military, a perfidious role by the European powers (Britain encouraged Barbary piracy against the Americans because it kept the United States out of the valuable Mediterranean trade routes), and a divisive domestic debate over the U.S. role in the world. As such, the underlying lesson contained in Victory in Tripoli is crystal clear: Middle Eastern despots change their behavior when faced with overwhelming force. Precision strikes, soft power, smart sanctions, and carrot and stick approaches are not sufficient. But London’s book is not a policy monograph; it is a work of history. Its great strength is in illuminating our present predicament by showing us the past. London’s descriptions of the tendentious and erratic negotiation tactics used by the Barbary chieftains, and the ubiquitous decay and weakness characterizing North African societies, could have been ripped from today’s newspapers. In a chilling harbinger of today’s mega-terror, London shows us how the Barbary pirates were forthright in citing the Koran to justify their plundering ways as a form of jihad. This piracy was not merely a vocation; it was a religious duty. …there is [no] …friendship with these states, without paving the way with gold or cannon balls; and the proper question is, which method is preferable. As we again face this critical choice, a look back at the first American crisis in the Middle East has become increasingly valuable. Mr. London has done a great service in telling this tale, and telling it well. Aaron Mannes is a terrorism researcher at the University of Maryland’s Information and Network Dynamics Lab, and the author of Profiles in Terror: The Guide to Middle East Terrorist Organizations (Rowman & Littlefield—JINSA Press, 2004). Fourteen years ago today Aum Shinrikyo released sarin gas on the Tokyo subway. A few years ago I wrote a short post about it on my old blog, which I re-post below. (The old blog is now defunct, but I am slowly posting it into The TerrorWonk.) At the time, this was seen as the future of terrorism. In retrospect, there are enormous barries to terrorist groups producing and delivering WMD in major quantities. In a chapter of the Stimson Institute's October 2000 publication Ataxia: The Chemical and Biological Terrorism Threat and the US Response, Amy Smithson shows how little Aum accomplished relative to its massive investment in chemical and biological weapons. The sarin attacks killed 12 on crowded Tokyo subways. Supposedly 5500 were injured by the sarin attacks, but the vast majority experienced minor symptoms and or were merely scared - there were 54 serious injuries. While these injuries and deaths were tragic, conventional attacks on subways have wreaked much more terrible damage. Suicide bombers on London's subway in July 2005 killed 52, bombs planted on the Mumbai trains killed 209 in 2006, and the Madrid train bombings killed 191 people. Relative to the investment (and Aum Shinrikyo had far more resources and expertise than most terrorist groups are likely to acquire - including a number of qualified scientists) WMD production does not pay off. Successful terrorist groups employ cold hard logic in developing their tactics and capabilities. While many terrorist groups have shown a willingness to employ WMD, terrorist use of WMD has - thankfully - had limited efficacy. However, if the acquisition costs decline dramatically, this could change. Some kinds of WMD might become easier to produce, a state may choose to provide it, or terrorists may be able to procure from corrupt or failing states. But this is cold comfort in the face of the continual adaptability terrorists have shown using readily available technology. The focus on the 3-year anniversary of Operation Iraqi Freedom overshadowed the anniversary of another day important in the annals of terrorism - Aum Shinrikyo's sarin attacks on the Tokyo subway. The strange cult, with its apocalyptic ambitions, is right out of a Bond thriller. Their use of sarin and their attempts to acquire biological weapons raise interesting questions about the future of terrorism. Did Aum Shinrikyo, which only had limited success at acquiring WMD despite its recruitment of top scientists and vast financial resources, show just how high the bar would be for a terrorist group to acquire WMD? Or were these attacks the equivalent of WTC I, a harbinger of a much deadlier attack in the future. Another aspect is how Aum Shinrikyo represents an "X" factor terrorism that is very difficult to predict or deter. Much of the terrorism today is connected to radical Islam. There are also various terrorist groups left over from the Cold War and various separatist movements - most notably the FARC and the LTTE. Aum Shinrikyo represents something very different - a truly radical group disconnected from any political stream. Aum Shinrikyo was actually a large group and carried out its attacks, at least in part, because its many enemies (particularly the Japanese government itself) were beginning to crack down. But smaller groups with equally bizarre goals, fueled by obscure frustrations, could operate under the radar screen and carry out mass attacks. A final note - Aum Shinrikyo operatives, on the order of the cult's leader, underwent flight training in Florida. There is no evidence that they made any attempts to use this training. It is just an odd, disturbing coincidence. Some time ago, in response, to legitimate concerns about possible illicit uses of mobile banking, I wrote that mobile technology also offered enormous counter-terror and development opportunities. It turns out, as a thoughtful commentator mentioned, that USAID is already on the case. I hope the public diplomacy community follows suit. Really development and public diplomacy can go hand in hand – particularly now with 60% of the world’s population using mobile phones. It may turn out that simply dispersing mobile phones or using them as a means to distribute aid will prove to be one of their greatest development roles. Also, people could be paid to access valuable information that they might not seek on their, but that might prove very useful - such as health education. As it happens, in my coursework at the University of Maryland I am studying surveys. In the United States, where random dialing surveys were – until recently – considered a terrific way to reach representative samples, mobile phones are a source of frustration. Certain demographics are unlikely to own a landline at all and surveying mobile phones is problematic because the exchanges are not tied to a particular geography. But in class I pointed out (and the USAID folks get it as well) that over the long-term mobile phones are going to be a tremendous boon to surveys. One big problem with surveys is reaching people at all, but mobile phones are not attached to a location, but to the person. 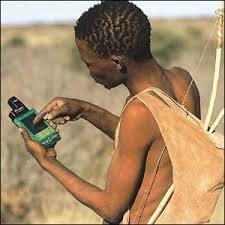 Also the mobile phone can reach people multiple ways, so that the survey can combine verbal and “written” components. Best of all, people can be paid – perhaps by free minutes or in cash – to participate. Cellphone companies can give people the option of making themselves available for surveys in exchange for reduced rates and then sell the lists to marketing companies. There is no privacy issue as participation would be entirely voluntary. Cellphones offer a tremendous way to create a feedback loop between providers and consumers in which needs can be quickly identified and addressed. The producer and consumer concept are not limited to commerce. It applies to development issues and counter-insurgency. Armies fighting insurgents (if they are doing a decent job) collect lots of data about their progress and public attitudes. The ubiquity of mobile phones will make this challenge much easier. A brave new world – and yes, bad guys will figure out how to abuse it – but the benefits will almost certainly outweigh the costs. The news, discussed in a previous post that India and Pakistan were involved in very secret negotiations solves two minor mysteries. First, it clarifies why the Bush administration hung on to Musharraf, even as his political standing collapsed. Unlike other countries, such as Egypt and Saudi Arabia, where the Bush administration gave only lip-service to reform, in Pakistan there were viable civilians alternatives in Bhutto’s PPP and Sharif’s PML. The conventional wisdom was that the administration needed Musharraf to chase al-Qaeda in Pakistan – but really any non-Islamist Pakistani government would have offered this support. The current government has permitted US drone strikes from a base within Pakistan. But if the Pakistan-India peace talks were in an advanced stage, it makes sense that the administration would have wanted to give them the fullest opportunity to complete the talks, which would have had enormous strategic benefits for the region and the United States. The second mystery is how little effort LeT put into plausible deniability for the Mumbai attack. Surely they must have had some inkling about the vulnerability of cel-phones and other mobile communications devices to eavesdropping – to say nothing of the extensive physical evidence. But, if the attack’s primary purpose was to drive a stake through the heart of any Pakistani-Indian peace process, then allowing the attacks to be linked clearly to Pakistan was part of the strategy. The fact that the LeT assessed (accurately, as it turns out) that the Pakistani government would not undertake a harsh crackdown when their role in the attacks became clear is extremely frightening in its own right. The fighting sparked by the storming of the Lal Masjid Mosque in Islamabad triggered the insurrection in the tribal areas. A crackdown on LeT (and its parent Jamaat ul-Dawa) would undoubtedly spark open rebellion in parts of the Punjab – in the very heart of the country. Kashmir Peace: Another Mumbai Casualty? "It is too early to say." In the last week’s issue of the New Yorker Steve Coll reported that in 2007 India and Pakistan where, through diplomatic back-channels, engaged in talks “so advanced that we’d come to semi-colons” on a deal over Kashmir. Unfortunately, Musharraf lost his political credibility and had to resign from the Pakistani Presidency before the deal could be completed. The new civilian and military leaders are, by most accounts, inclined towards continuing the process. But in the wake of the Mumbai attacks, it is difficult to see how this process can be re-started. Pakistani-Indian rapprochement could be a tremendous aid to the Pakistani leadership in their efforts to stabilize their deteriorating country. If the Mumbai attacks have made that impossible, then the Mumbai terror attacks may prove to be one of the most consequential terrorist attacks in history. Yesterday’s attack on the visiting Sri Lankan cricket team, while a tactical failure relative to its ambition of copying the Mumbai assault (the cricket players survived and were not taken hostage and overall casualties were limited), was another blow to Pakistan’s domestic and international prestige. Other incidents highlighting Pakistan’s possible collapse were the all too successful attacks on highly symbolic targets such as the Islamabad Marriott (the watering hole of Pakistan’s elite) and the assassination of former PM Benazir Bhutto. The recent “deal” allowing Islamists to govern the Swat Valley is yet another example of the state’s loss of control. Unfortunately, Pakistan’s twin assets of nuclear weapons and a strategic location (American efforts in landlocked Afghanistan will become untenable without access to Pakistan’s ports) mean that the country cannot be ignored. It would require multiple volumes to explain the complex interlocking problems facing Pakistan. But, Pakistan’s conflict with India, primarily over Kashmir, is central and exacerbates many of Pakistan’s other challenges. Having fought (and lost) several wars with India, Pakistan is locked into an arms race that it cannot win. Beyond India’s demographic and economic advantages, Pakistan has long borders and little strategic depth. Massive outlays for defense needs have choked off funds for much needed development, while the military – once respected for its relative probity – is becoming yet another Pakistani institution mired in corruption. Islamist organizations have filled the void left by the government’s failure to provide basic social services like education. The conflict over Kashmir is not merely over resources and territory. It also touches on Pakistan’s identity as the homeland for Indian Muslims. In the face of the Indian threat and its own panoply of ethnic divides, the government relied on Islam as a national unifier. These policies, combined with ISI support, created a fertile ground for Islamist groups such as Lashkar-e-Taiba to take root. An agreement with India over Kashmir, the key point of Pakistani-Indian contention, would have allowed military reformers both to shrink the military overall and to re-orient it from its conventional war India mission of countering India to a lighter counter-insurgency force that can keep peace within Pakistan. An agreement with India is no guarantee that Pakistan would stabilize – the Islamist groups are now effectively self-sustaining and the country has been so poorly governed that reforms may be too little too late. But it is difficult to see how Pakistan can make the necessary institutional changes without an improved relationship with India, and the agreement described in Coll’s article would at least have improved Pakistan’s odds. There is an interesting argument that most terrorism proves to be politically ineffective. This excellent paper surveys major terrorist groups and finds that, with few exceptions, terrorist groups do not achieve their political ends. The most notable exception is Hezbollah’s campaign against the U.S. and other Western powers in Lebanon in the 1980s. But there are also terror attacks that have world historical significance beyond the orchestrating organization’s ambitions. 9/11 would be an example. Sadat’s assassination is also an example of an attack that did not achieve specific political goals (the Egyptian government remained in power) but did remove the Arab politician who had the greatest potential to change the dismal course of Middle Eastern politics. If the Mumbai attack has successfully derailed Indian-Pakistani negotiations for the foreseeable future, then the attack may join the annals of terror attacks with great historical reverberations. It is not inconceivable that future historians will see the failure of peace talks as Pakistan’s last chance to come to grips with its internal challenges and avoid collapse. If this collapse occurs, even laying aside the nuclear weapons, it is sure to be a geopolitical earthquake leaving a vacuum in a strategic location and sending waves of refugees into the unstable Middle East and beyond.